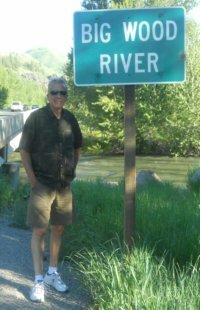 The Big Wood River located in central Idaho near the vacation resort towns of Sun Valley and Ketchum has some excellent fly fishing. The stream flows through both resort towns as if flows south from the high mountains. Fishing this stream in the fall brings the best fishing along with the great fall colors. This is a great place to fly fish. The river runs through the resort Idaho towns and is nestled between the mountains on both sides. The river as it winds through town is very beautiful. Most importantly it has some nice Rainbow Trout along with Browns, Cutthroat and Whitefish. 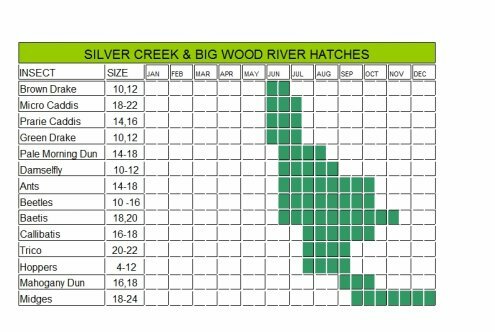 The river has catch and release areas and barb-less hooks only areas so be sure to read the fishing regulations for this river. The fish are not huge, but you will find many in the 12” to 16” range. But if you are like me you will find the city of Sun Valley very charming, and the early fall change of colors is worth the trip. In addition to the Big Wood there are several Mountain streams in the Wood River Valley that flow into it near town that you can explore while in the area. I fished a pond just North of Sun Valley and ended up face to face with Arnold Schwarzenneger. You never know whom you will see. Some of the flies you will want to take with you would include Nymphs, Streamers, Parachute Adams and Royal Wulff. Fishing is pretty good from June through October. This is a wading river as it is pretty shallow with a flat rock bottom. Big Wood River area map. Other Idaho Fly Fishing Streams. Plan your next fishing trip. Know the mileage to your next fly-fishing destination by using this Google map of rivers.